Waleed Ejaz received his B.Sc. in Computer Engineering from University of Engineering and Technology, Taxila, Pakistan. He completed his M.Sc. degree in Computer Engineering from National Univeristy of Sciences and Technology, Islamabad, Pakistan. Further he joined the Department of Information and Communication Engineering of Sejong University, Seoul, Republic of Korea, as a Ph.D. student where he received Ph.D. in Feb. 2014. Prior to his Ph.D, he worked in top ranked universities of Pakistan and Saudi Arabia as a faculty member. Since 2014, he has been a post-doctoral fellow at Queen’s University, Kingston, Canada. In addition to Sejong University International Ph.D. scholarship, he was also awarded Sejong University research travel grant for consecutive three years during his Ph.D. He was guest editor as well as workshop co-chair for international journal and conference in 2013. He is a member of Institute of Electrical and Electronics Engineers (IEEE) and currently serves as an Associate Editor for the Canadian Journal of Electrical and Computer Engineering. 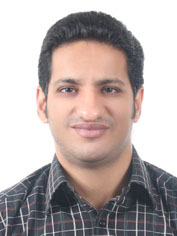 His research interests include cognitive radios, M2M communication, and next generation wireless networks.